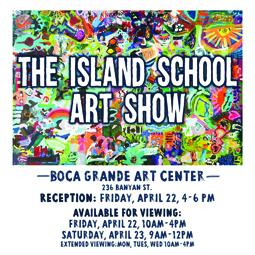 The Boca Grande Art Center and The Island School are delighted to host the annual Island School Art Show. Opening night is Friday, April 22, from 4 to 6 p.m.
On Saturday, April 23 the show hours are from 9 a.m. to noon. Additonal show hours are Monday, April 25 through Wednesday, April 27 from 10 a.m. to 4 p.m.
Come over and see the artwork from the students of The Island School. The Boca Grande Art Center is located at 236 Banyan Street, Boca Grande. For additional information, call the Boca Grande Art Center at (941) 964-1700.